Early medieval Irish history has an unusually rich body of evidence for an area which was not under the rule of the Roman empire. Year-by-year written records of events (annals) were kept by monasteries from the early centuries of Christianity, being well established by the early 7th century. This manuscript has one of the most important of these, the original copy of the Premonstratensian house of the Holy Trinity, which is located on an island in Loch Ce (Lough Key). Probably based upon earlier annals of the Cistercian abbey nearby at Boyle, they were written under the patronage of the MacDermot family and are sometimes called the Annals of Boyle. Beginning with events of Genesis, the annals continue through political events and the history of Christianity on the Continent and in Ireland into the 13th century. The annals were part of a long-term project of the Irish aristocracy to link native history to that of Christianity. Important events relating to the church, earthquakes, terrible storms, sightings of mermaids, battles and deaths of notables such as kings and poets figure in the annals of the 12th century. On this page, the 'KL' in the first line indicates the year, 1111, and records a synod of clerics. Each 'K' at the beginning of an entry indicates the passing of one year. 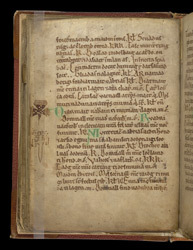 The crosses in the margin and large green letters commemorate the deaths of Diarmaid Ua Briain, king of Mumha and Leth Mogha, Ruadrhi O'Conchobhair, king of Connacht (1118) and Muirchertach O'Briain, king of Ireland (1119).